When it comes to themeless crosswords, is there anything more polarizing than triple-stacks and quad-stacks? Some people love ’em because they look cool. Some people hate ’em because they too often require a lot of compromises in the fill. (Presumably some people are entirely neutral on the matter and take little notice of the grid pattern…) I am usually in the “hate ’em” group, unless the fill contains very little that irks me. This one has some really great 15s, one lousy 15, and lots of fill that leaves me wishing for a puzzle without triple-stacks. The goodies: MATRYOSHKA DOLLS with the recursive clue 59a. 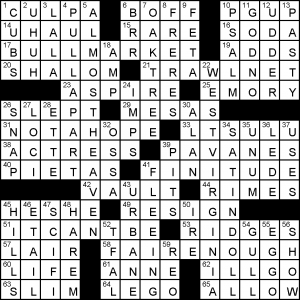 [Things that contain 59-Across that contain 59-Across that …]. “GOING BACK TO CALI.” ALL OVER CREATION. Footballish GO DEEP, “NO, MA’AM,” EYE-POPPERS, the Olympics’ TOKYO GAMES, and SMEAGOL. Have you seen the anti-Brexit ad featuring Andy Serkis as a Gollum/Smeagol/Deagol version of Theresa May? If you’ve seen the Lord of the Rings movies, this will sound quite familiar! The price paid for the six-pack of 15s is fill like AFI LIST (which I don’t think makes the grade as a crosswordable phrase), HST (but thumbs-up for the update from Truman’s initials to Hawaii’s time zone, [It’s two hours behind Pacific: Abbr. ]), KRISPY (bizarrely clued as 15d. [Hard to eat quietly, in adspeak], when the most prominent use of “krispy” is in Krispy Kreme doughnuts, which are not actually crispy or noisy to eat), RUY, TEN-ACE, NOLO, MISDO, ALDO, PRIE, REO as the 82-years-gone car, and letters ENS. There’s also one 15 I didn’t care for one whit: 54a. [“Gil Blas” author], ALAIN RENÉ LESAGE. Please comment if you have read Gil Blas or anything else by Lesage, and only if you did so before encountering the title and name in crosswords. 3.25 stars from me. How’d you like 2018’s last Friday NYT? I don’t know if this puzzle represents a policy change from the LA Times or not. As far as I can see, a quasi Saturday themeless has arrived a day earlier this week, with a themeless block/word count of 33/72. I don’t think I’m averse to the idea of two themeless puzzles a week if the quality is there. As far as I know, Rich Norris receives the most submissions for Saturday (or did, at one point anyway). I say quasi, because there are two mini-themes. In the downs – ALMOSTHEAVEN/WESTVIRGINIA, though if Wikipedia and others are to believed, primary songwriters Danoff and Nivert had little experience of WESTVIRGINIA and the song was initially set in Massachusetts. They also had Johnny Cash in mind as a singer… (RIDGES may also be a nod to “Blue Ridge Mountains”. BULLMARKET and FAIRENOUGH may also be a mini-theme, but that may also be serendipity. It is typical of these fish-nor-fowl puzzles to not have a lot of other flashy entries. There’s a lot of other dialogue going on the puzzle: SHALOM, NOTAHOPE, ITCANTBE, FAIRENOUGH, ILLGO, UHUH… LEDE is also a perfectly reasonable entry with friendly letters, and yet one I never see in puzzles as much as I expect to. This entry was posted in Daily Puzzles and tagged David Steinberg, Tracy Bennett, Victor Fleming. Bookmark the permalink. Liked most of NYT, but CONVY crossing ALAIN RENE LESAGE was brutal — I don’t know either person, and I’m not sure why anyone should. Also, GUST and GUSTO in the same puzzle? 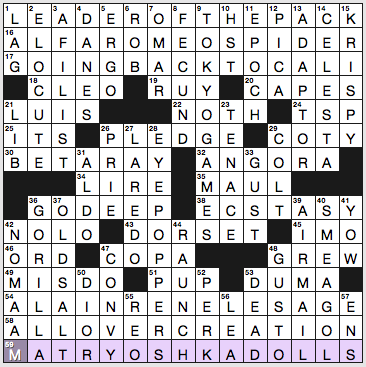 I was very proud of putting in MATRYUSHKADOLLS without help, although I had to correct the U to an O later. Bigger problem was that I had ADAPTER at 13D, which gave me CETY, which seemed OK as a cosmetics company I’d never heard of and is consistent with the clue. Finally I figured out it should be COTY and ADAPTOR, which seems like a less common spelling. In any case I don’t understand why “many a battery charger” is an adaptor/adapter, unless an adapter/adaptor doesn’t mean what I think it means. Also, I had SPYDER initially but saw the error quickly. Too many proper names, too many opportunities for misspelling, IMO. In the Edgar Rice Burroughs book, Tarzan is raised by a species of great apes called Mangani. They are intermediate in size between chimpanzees and gorillas and are explicitly not gorillas. In some of the movies, the are gorillas and, of course, anyone can have friends. TENACE is not hyphenated. It refers to any sequence of two cards of the same suit separated by one, such as the ace and queen. If the king is on side, it is trapped. I put in ALL OVER THE PLACE, which held me up, especially because I did not know the dolls. I tried to stretch Victor Hugo over 54A and then remembered his play was RUY Blas (how’s that for a coincidence?). Gutenberg has Gil Blas in Spanish, Finnish and Dutch, but not in French or English. But French and English versions in Kindle format can be had on Amazon for $0. Enjoy! For me this was a slog. The fill was brutal. E.g., AFILIST and CELESTA, I have never heard of either. AFILIST is complete green paint. I agree the puzzle was too heavy on propers; I assumed the author was ALAIN RENELESAGE (2 words) until I came here. Thank you to all of you who proffered suggestions on getting the “No Purchase Necessary” TNY puzzles. I have them all now! So what’s up with the LAT? I came here to see what the theme was and maybe there isn’t one? Strange…Victor’s a blogger here (I think), so what gives? Is it possible that the LAT is a John Denver tribute puzzle, that might be a little too complex to run on Monday, his actual birthday? And since there is a mini-theme, it wouldn’t be slated for Saturday. Whatever the decision, I liked the puzzle (and the song!). And the review, too. Thx for comments, Alan and Lise. Tracy and I wrote this puzzle about a year ago. The intent was themeless with an Easter egg. I think the original clue for 5d was [Not sublime… just shy]. Anyhow, Rich’s call was to clue 5d & 22d as an overt mini-theme. Why is there nothing more on The New Yorker week-long contest? Do you think anyone doing it is an obsessive completist with nothing better to do? I think the contest is over, but I’ll play it safe by avoiding spoilers. Complaints by me and others this week about its trivia still trouble me a lot. This just was not fun. It did get better for me Thursday, although it had a curiously narrow idea of the year’s politics, based on one appealing personality. Naturally I did ok with “literature” on Friday, although it still felt like trivia. I’d in fact read one of the year’s books and have a library hold on another, so those were easy. I must have read the New Yorker excerpt mentioned in the clue for a third, but I seem to have been unimpressed enough to have put it out of my mind. I didn’t recognize it — or a fourth. Did I even see a review of that one? I also didn’t get the joke about a certain movie as “shallow” (any help appreciated) and think they don’t get “ontology.” It’s not about, well, certain things (trying to avoid a spoiler) but about, shall we say, thingness, which can’t be pluralized. Last, the contest part was totally unimpressive, as one didn’t have to solve the puzzles to play it, just glance at a clue a day. Indeed, some might say not even that, rather than make a reasonable guess as to what they’d count as relevant and new in 2018. So I’d rate the entire week 1 star. “Shallow” is the title of a hit song from the soundtrack. I did the first two puzzles and the contest clue in the third, and then was not inclined to keep going because I saw where the meta was going. I took a course in college on the 18th century English novel, so I knew the title, Gil Blas, but it was not on the reading list, and I did not know the author. Pretty obscure. We read “Clarissa” instead, which deserves some sort of rediscovery.